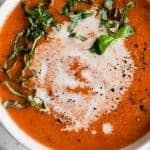 Roasted Red Pepper Soup! This bold and flavorful soup is made from roasted red peppers. My kids say it tastes like pizza! The perfect warm and comforting dish! Place the baking sheet of peppers and garlic under the broiler in the oven and broil for about 15 minutes until the skins are blackened. Remove from the oven and place the peppers inside a tupperware container, and close the lid. This will allow the steam to soften them more. Keep in there for another 15 minutes. Place the bell pepper, garlic cloves, and onion into a food processor (affiliate link) and processes for about 3-5 minutes until there are no large chunks left. Add the mixture to a large pot, add in the chicken stock, hot sauce, salt, and pepper. Bring to a simmer, cover and allow to simmer for another 20 minutes. Remove from the heat. Stir in the sour cream. Place the oregano in your hand and crush it up slightly to release the flavor and to make the pieces smaller, then pour into the pot. Stir until completely combined. Serve with extra sour cream and fresh herbs on top if desired.